Grappa Lane is named for my extraordinary horse Grappa, seven-time national champion and the embodiment of vitality and style. He has been with me twenty years, more than half my life. A dappled bay with cresty neck and bright eyes, he is a teacher and an old friend. He reminds me every day how I want to live: with gratitude, joy, curiosity, class, and a little mischief. As a show horse with a wild streak, he taught patience, diligence, and total presence. He inspires appreciation of beauty. The Best Horse trophy at the US Equestrian Team Talent Search Finals is named after him. Teenage rider-girls all over the country discussed him in Internet chat rooms. He almost became a Breyer horse model. (Breyer, you shoulda done it!) Grappa is one of the all-time greats of the sport. He won seven national equitation championships. At age 25, he attended our wedding at Philip’s family’s farm. He posed handsomely for portraits in his old-pro-in-front-of-the-camera way, dappled and miraculously youthful. 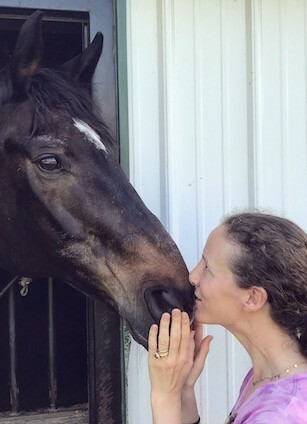 Sarah is a rider, horse breeder and writer. She owns and operates Turnabout Farm, breeding and developing top-quality jumpers and western reining horses. She serves on the National Advisory Committee of the US Equestrian Team Foundation and on Horse Network’s Board of Advisors.